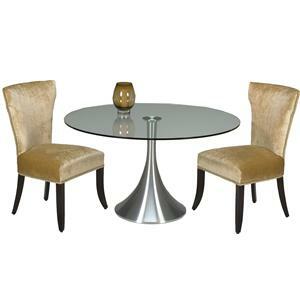 The Del Mar table is a stunning Metropolitan design that combines a spun aluminum base with brushed nickel finish and a clear glass top with flat polished outer edge. The trumpet shaped cylinder base is supported with an inner steel core. The 54" round top is secured to the base by a metal disc that is bonded to the bottom of the glass. The Del Mar table is also available with a silk screened black glass top as Del Mar 07-565-92. 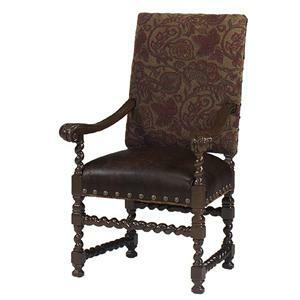 The Canterbury dining arm chair is an adaptation of an early 17th Century style. 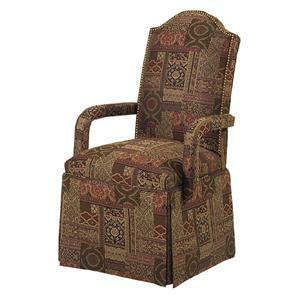 This chair features barley twist hand carved legs and stretchers. The upholstered back is open between at the seat allowing the exposed wood back post to be seen on the side and back. The generously scaled arm chair features a beautiful, carved arm with grooved spiral carvings that flow down and out the front of each arm. 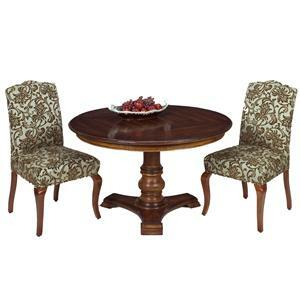 The Mesa table is a tripod pedestal table featuring a turned pedestal and smaller 51.5" round top. The table is made from reclaimed wood that is over 100 years old. The wood is from the Cypress family and is harvested out of dense swamps by hot air balloon. The natural aging process of nature's elements and water have given this wood its character. Hand finishing, using nitrocellulose finish materials, bring out the character of the wood by working the finish into the wood to create a rich patina. The Calais dining stool is a French design with shaped, carved legs featuring a leaf carving at the angle of each leg post. The upholstered seat is attached to a memory swivel. 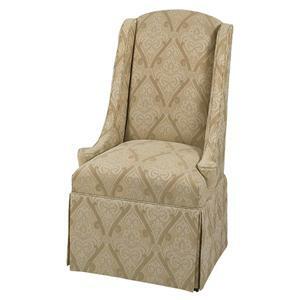 The upholstered back with shaped top back rail is concave to cradle and support ones back. The exposed wood arms feature the same leaf carving as shown on the leg posts. The metal foot ring comes standard in the antique brass look powder coat finish. It is available in a satin nickel finish on request at no additional charge. The Destin chair is an updated interpretation of a 5th Century Klismos chair design. This chair features a T-shaped back having a gentle curve that will cradle your back and shoulders. The back tapers to meet the rounded seat. Splayed, tapered, exposed wood legs complete the silhouette. 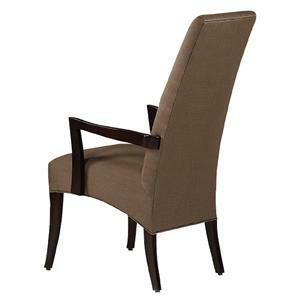 The Chandler dining arm chair features an arched camelback top rail. The inside back is elegantly framed by nail head trim. The tightly upholstered seat is gently shaped across the front rails. A tailored, dressmaker skirt completes this chair. The upholstered arms are rounded at the front. 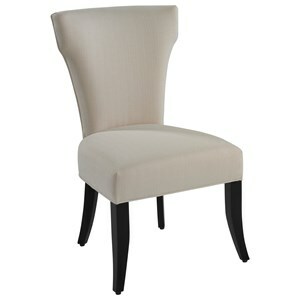 The Hollister dining arm chair is a clean, urban style chair. The exposed wood is softened with upholstery on the chair back and seat. Turned legs, having simple Shaker style characteristics, have a low 'H' stretcher centered between them. The arched back with tight upholstery is open at the upholstered seat. The arm stumps, having the same clean, simple turnings as the chair legs, support the tear drop shaped top arm parts. The Grayson Host dining chair is a more generously scaled chair making it ideal for a host or hostess chair in a dining room. The smooth back with concave shape is tightly upholstered the rolled top has soft pleats on the outer edge. Welt framed track arm panels flow along the outer edge of the chair and out the outer edge of the tightly upholstered seat. 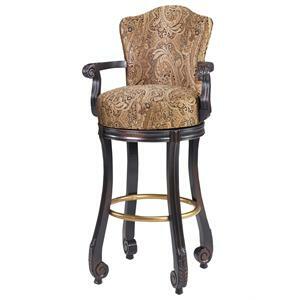 This classic traditional style is updated with saber shaped, exposed wood front leg posts and tapered back leg posts. 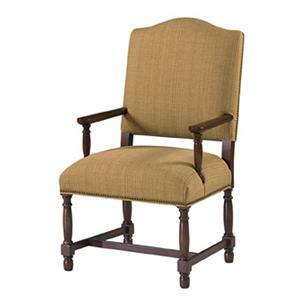 The Weddington dining chair is generously scaled to work well as a host or hostess chair in the dining room. The transitionally design wing chair has an arched back framed by thin, welted framed wing panels that flow down the side of the chair into a low turned doll head arm. 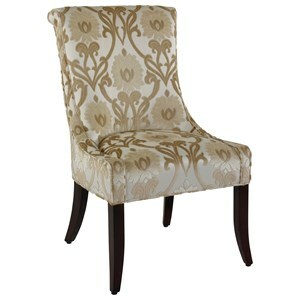 A tailored, dressmaker skirt complete the elegant and sophisticated styling of this chair. * Broad selection of fashionable styles and designs - many "designer looks"
Some of our dealers have said that they think we are building the best dining chairs on the market. You be the judge. We would be delighted to build dining furniture for you to meet your taste in furniture design and your pocketbook. We are confident that our furniture will bring you lasting pleasure and enjoyment.